The Regional Connector Transit Corridor in Downtown Los Angeles is a 1.9 mile long Light Rail System that connects the Metro Gold Line to the 7th Street Metro Station. 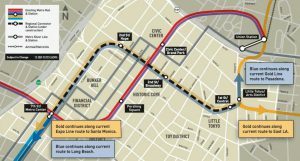 Passengers will be able to travel between Asuza & Long Beach and between East Los Angeles & Santa Monica on the same train. AVA has optimized the design of all three underground stations by simplifying the ancillary area layouts, showing functional horizontal and vertical adjacencies of the ancillary rooms. In doing this, we were able to reduce the footprints of the stations at all levels. This translated into station designs that were simpler and less expensive to build. Per direction of our Mechanical Engineers, the station vent fans and associated rooms and ducts were removed from all three station designs, and the Emergency Fans were configured to perform these functions. 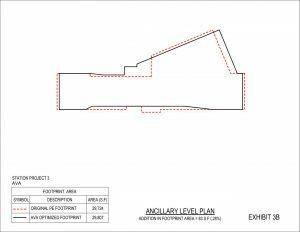 The tunnel vent fans were relocated from the lower ancillary level plan of the PE layout to the upper ancillary level plan of the optimized layout. The High Voltage Switch Gear Room, DWP Room and DWP Switch Room were moved from the lower ancillary level of the PE layout to the upper ancillary level of the optimized layout. 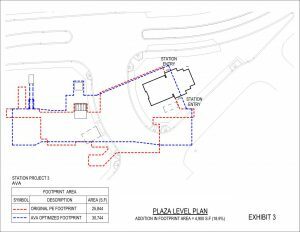 All major ancillary rooms at the upper ancillary level and the platform/lower ancillary levels of the optimized plan are laid out side by side and accessed by a common service/access corridor. The equipment access shaft, service stair and service elevator have been placed at one end of this corridor. 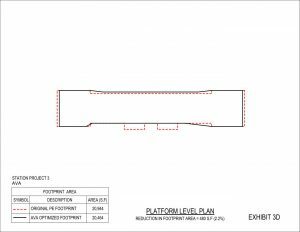 By optimizing the station layout, AVA was able to reduce the footprint of the upper ancillary level footprint by 27%, and the lower ancillary level plan footprint by 30% of the PE footprints. 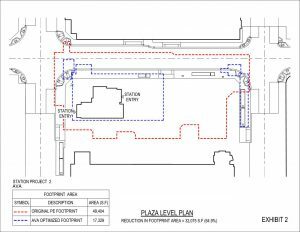 The auxiliary power rooms were removed from the PE auxiliary level plan and relocated to the concourse level of the optimized plan. 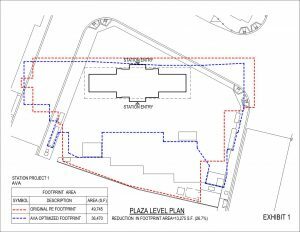 The ancillary rooms in the train box have been rearranged in the optimized plan to maximize the free area. The ancillary block has been optimized and consolidated into the same footprint at both levels to make it easier, and less expensive to build. A common equipment shaft within this footprint serves both levels. 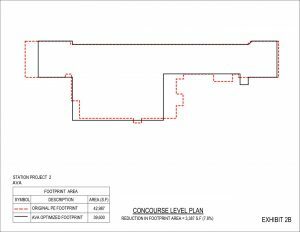 By optimizing the station layout, AVA was able to reduce the footprint of the ancillary level plan by 65%; the concourse level plan footprint by 8%; and the platform level plan by 6% of the PE Footprints. 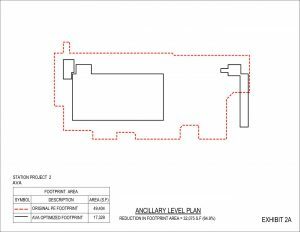 The auxiliary power room of the PE design was moved from the upper ancillary level to the ancillary level in the optimized plan. 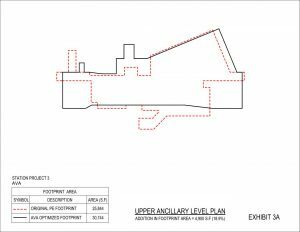 The auxiliary power rooms with their battery rooms and the TC&C Room with its battery room were consolidated at the ancillary level of the optimized plan. 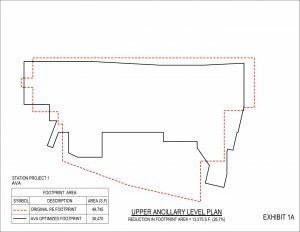 The DWP switch room, DWP metering room and traction power substation were consolidated at the upper ancillary level of the optimized plan. 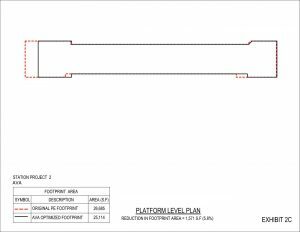 All major ancillary rooms at the upper ancillary level and the platform/lower ancillary levels of the optimized plan are laid out side by side and accessed by a common service/access corridor. An equipment access hatch serving both levels has been placed close to the center of this corridor. 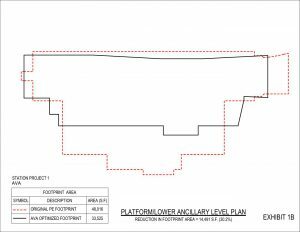 By optimizing the station layout, AVA was able to reduce the footprint of the upper ancillary level plan by 19%. Though the reductions of the footprint areas at the concourse and platform levels was not significant, the footprints were simplified and the bumps removed from the outer walls.